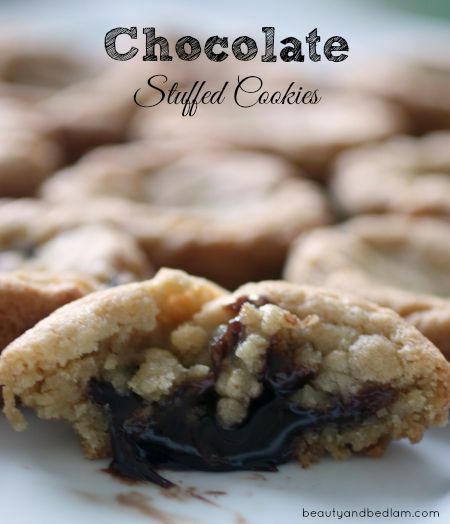 Chocolate Stuffed Cookies – SO EASY! Don’t we all have a day now and then when all the kitchen fairies align on our side and a small little change in a recipe ends up being a new Rock Star moment? It’s rare, but it happens and then you celebrate and tell everyone you know because you can’t imagine why you haven’t done this more often. And the great thing is that it’s more of a “concept” than a true recipe, so you can apply it in a ton of different ways. But don’t worry, I’ll give you the recipe too. While I’m adding a “make it all homemade from the goodness of your sweet kitchen” recipe down below, you can elevate a store bought cookie dough mix and no one will know. I won’t tell, if you won’t. 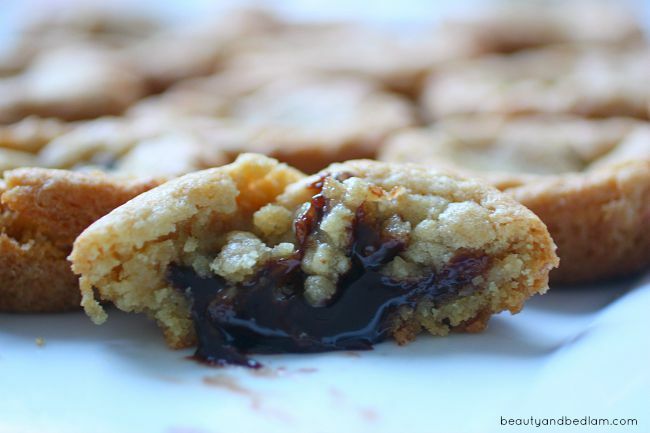 Chocolate Stuffed Cookies! I mean really. You can use sugar cookie, peanut butter, or chocolate chip cookie dough. Just pick your favorite and then tuff it with some of your favorite fillings. I know, I know. Why haven’t we always been doing this? What I did here was use a basic cookie dough recipe and then I added just a tad of chocolate frosting to the middle. That’s why it oozes. If you like that ooze effect, you can add a little solid hot fudge too – so so yummy. To make this gourmet worthy, I added a cookie to a bowl and then topped with some ice cream and drizzled a little chocolate sauce on top. Yes, my college guys are coming home this coming weekend and we need to whip up some more since these were gone in a heart beat. Here is the original Chocolate Stuffed Cookie recipe that I’ve played with. It’s the best in chocolate surprises for sure because it calls for stuffing the cookie dough with a Hershey Kiss. It doesn’t ooze the way chocolate frosting, sauce or hot fudge does, so it’s less messy. If I substitute with hot fudge, then I do chill the cookie dough first. Instead of flattening the dough like I do when I use a Hershey Kiss, I make a small “muffin cup” of cookie dough, put a tad of solid hot fudge in the “well” of the cup and then take additional dough to cover it. It makes a slightly bigger cookie than your traditional ones. Combine the softened butter and brown sugar in medium bowl. Combine flour and cinnamon in another medium bowl. Flatten each ball into a 2 inch round. Place one inch apart on ungreased baking sheet. Place Hershey kiss in the center of each round. Enclose the candy with the cookie dough, making sure the candy is completely sealed in the dough. Bake until golden – around 15 minutes. *Optional Combine powdered sugar and cocoa in small bowl. Sprinkle over hot cookies. Cool cookies on baking sheet for 10 then, then transfer to wire rack to cool completely.